Indirect Aim: Visual and fine motor development. Direct Aim: Early practical life experience using sponge, water, and squeezing with hands. Materials: Small sponge, bowl or dishpan, water, a towel for clean up. You can take a regular size sponge and cut it in half (or in thirds) to fit the child’s hands. A different color sponge can be used than your own kitchen sponges, then washed in the dishwasher or placed in the dirty laundry. A small bowl or plastic container can be used, albeit the bowl/container will get turned or knocked over by the baby. You may also try using a dishpan/bucket (square and shallow and fits in your sink). Try also using a small amount of water, and it can be warm water. This activity is ideal for the kitchen floor. You can also try sponging in the bathtub/at bath time. You want your baby to have a fun experience, the sponge activity is not meant for cleaning up spills, but for exploring sensorially, with use of language: “This is a sponge.” “Water.” “Spill.” And so forth. Before introducing this activity to younger infants, place only the container and the sponge in the environment for the infant to explore. When introducing the activity, sit facing the infant. Have the bowl--with water, and sponge—next to bowl, ready, plus a towel behind you for handy clean up after the baby is done playing the activity. Place sponge down next to bowl. Allow the baby to explore. You can gently guide the baby through the steps. You may also wish to place the bowl and sponge in a dishpan. However, the dishpan will most likely get tossed and turned over and could hamper the baby’s reach. You can also present this activity in the bathtub. When the baby is done exploring the activity, place it back on the shelf or in the toy/activity area, without the water. You can also have an area, perhaps in the kitchen, where the water practical life activities are kept and used. Extension: Bring the same sponge and bowl to the eating area when the baby is eating for wiping up spills. Wipe with the sponge, and squeeze into the bowl. Invite the baby to have a turn. When the child is walking and can easily reach the sink by way of a step stool, he can be shown to squeeze the sponge in the sink, then place the sponge back in the practical life area (on a plastic tray or bowl) for future use. 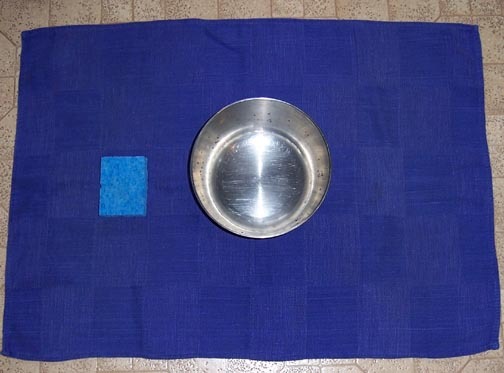 A small face cloth can be used for drying. 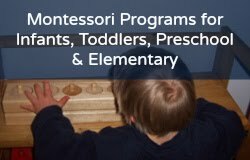 Want more Montessori activity blog posts? Go here and here!